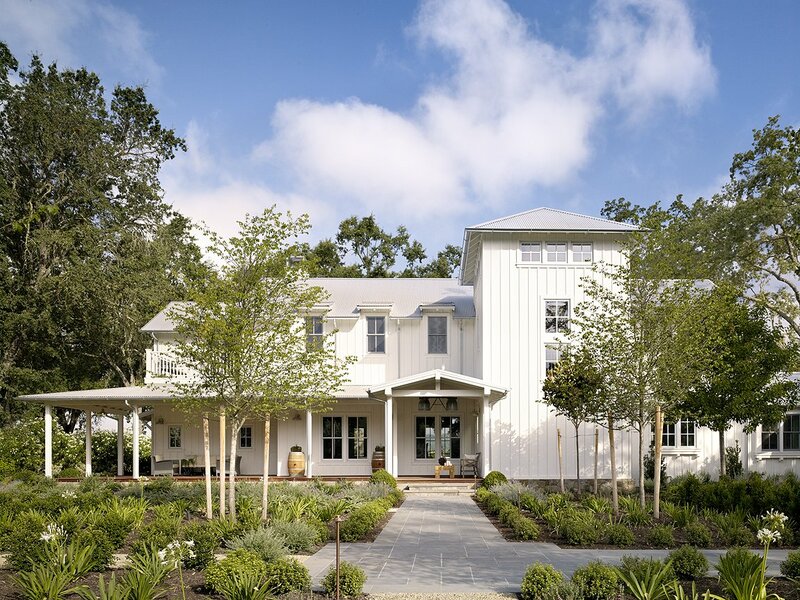 Inspired by the region’s agricultural heritage, the Main House of this Napa farmhouse is sited to frame the views of the surrounding vineyards and ridgelines beyond. In the tradition of the farm house vernacular, the board and batten structures are lined with a series of deep, shaded porches welcoming indoor-outdoor entertainment. To create a setting for informal entertaining of family and friends, the floor plan was conceived as a series of flowing spaces with the kitchen as the central gathering room. A heated screen porch opens on to a bluestone terrace creating an inviting setting for informal dining. The Napa farmhouse compound of structures includes a Main Residence, Guest House, Barn, pool and tennis court. The site is divided into a series of connecting formal and informal gardens defined by low stone walls, fruit and olive trees and stunning valley oaks.